Bowalley Road: "Dear Winston" - An Open Letter To The Leader Of NZ First. "Dear Winston" - An Open Letter To The Leader Of NZ First. With all you’ve got on this week, it’s highly unlikely you’ll have time to read these words. Even so, I thought it was worth adding my ten-cents-worth to the raucous debate about what NZ First should do with the final election result. Your party has been left holding the nine votes needed to assemble a majority in the House of Representatives. As you wryly observed, this puts it between the Devil and the deep blue sea. For the next three years, New Zealand’s future lies in NZ First’s hands. Before adding anything further, however, let me be very clear about the expectations of the New Zealand political class. In the eyes of all those whose job it is to sell the status-quo to their fellow New Zealanders, your party has no choice at all – it must deliver all nine of its votes to National. Any other choice will earn you, and your party, their bitter – and active – enmity. That is not something to be casually dismissed. I’m sure the memories of 2008 are still very raw. Even from the perspective of a rank outsider, the behaviour of the political class on that occasion was a whole order of awfulness beyond the norm. How it felt up-close-and-personal, I can only guess. Still, that’s the way the political class rolls. Nine years ago, they needed you gone – and you went. Nine years later they need you to kiss-and-make-up with your former tormentors – and they expect you to do it with feeling. Telling them “No.” would be a mighty-big – and a mighty brave – call. What is it, then, that tells me a decision in favour of the status-quo is not the decision you wish to make. There’s a clue, perhaps, in the illustrious name you bear. Winston Churchill was a conservative, and yet he served in one of the great reforming governments of the twentieth century. In 1940, when vast swathes of conservative Britain were every bit as keen to make peace with the fascists as conservative France, he chose, instead, to lead his people in the paths of righteousness – to their finest hour. 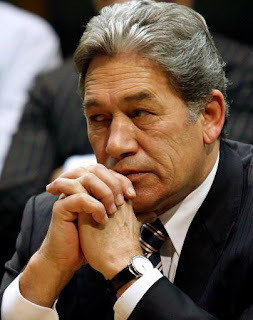 It’s part of the explanation for why the political class fears and hates Winston Peters so much: his need to do the right thing – as opposed to the Right thing. The temptation must be very great to kick this slippery ball of choice into touch, and seat NZ First on the cross-benches. Resist it. A decision to abstain on matters of confidence and supply is just another way of siding with Bill English and his National Party. Keep your NZ First troops out of the fray and the Nats will win every confidence and supply motion by 57 votes to Labour-Green’s 54. Is that the legacy you wish to leave behind? An enfeebled minority National government kept in power by NZ First’s refusal to strike it down? Never think that by sitting, Caesar-like, on the cross-benches and giving the thumbs-up, or down, to every piece of legislation that comes before the House, you will earn the admiration and support of your fellow citizens. Rather, they will curse you for making such a circus out of their democracy – and such a bonfire out of everything NZ First used to stand for. Neither Jacinda Ardern, nor James Shaw, possess anything like the quantity of true political grit required to change this country’s economic and social direction. But, if your political career has been about anything, it has been about acquiring the grit needed to, one day, truly put New Zealand first. It was Nietzsche who wrote: “What doesn’t kill us, only makes us stronger.” You have learned the truth of that; and, more importantly, you can teach the next generation of political leaders not only how to survive the difficult choices, but also how to turn them to their advantage. The National Party needs no such instruction. National and its predecessors represent all those who came to these islands – and who come here still in their thousands – to make money. Their one, unwavering, political objective has always been, and remains, to keep out of office, or drive from power, every individual and/or political party which stands in the way of private enrichment. Bill English and his colleagues have more than enough grit to go on doing what National has always done. Why would you choose to help them? I wonder if you recall these words you sent me 23 years ago? Changing the government will require a wise head and a great heart. You have until Thursday, Winston, to prove to New Zealand that you possess both. This essay was originally published in The Press of Tuesday, 10 October 2017. Interesting post. Can't really comment until Winston makes a decision. I think too - So Well Said. And I like the play on words - doing the right thing not the Right thing. Winston has done things we are thankful for, some of which I'm sure I have overlooked but the Winebox comes straight to mind. The machinations revealed about that were a precursor for what has come to pass with us being the Switzerland of the South. Then there was the Gold Card which was excellent but should of course have been extended to all Community Card people, with limits set. The art of politics is to achieve what you can and keep trying to maintain a fair and collaborative society, which we don't have now. So if Winston can keep faith with his famous namesake, and change the status quo road with almost indecipherable sign spelling the words D.nt Pr.ce.d Furt..r we would cheer. We need to turn off, and veer back towards old ground, but can't do a simple U turn: there is no simple road back, we must survey the ground, and find a new track. With new leaders that can talk and thump the table, and close the gaps between each proposal and method till there is one that works, with extensions and allowances for special cases, then we can start moving together to cope with our problems, present and future. That's what I would say to Winston, if he could bend his ear to hear. Then from hear to consider, from consider to bear in mind while negotiating, give a little to keep the conversation going, include the Greens with some reservations, they have an important part to play, a consistuency that looks ahead, and altogether we would have an able, dynamic government that covers all the squares on the board. We hope it won't be a game of cold Draughts but one of cunning Chess with a difference, all the players will be winners. The music from Chess is appropriate to illustrate our drama, tense and wary, afraid to hope yet painfully propelled to do so. We will all finally find out just what one Winston Peters is made or not made of in the next two days. And the decision he makes will seal his place in NZ political history once and for all. provincial towns. And surrenders to the arrival of a 1000 wealthy (or ostensibly wealthy people)arriving from China weekly or not. Because one thing is true and that is those National policies. are not going to change.....money talks loudly. The notion Peters can reach any deal with National let alone implement it.is far-fetched. If he does reach a deal it is probably not worth having, either for the 7.5 % of voters who voted for him or for the party. This time despite the smiles and platitudes and the ministerial leather is just not worth it. The year they are predicting Asians will supercede Moari is 2023. So the recent population growth (immigration) is bringing those tipping points forward. Let's look at the overall makeupof the population. Pakeha New Zealanders willgrow but decline as a proportion of the population. In fact probably not far off being less than 50% of Aucklands population? No, I think that's quite sad actually, that's one of those tipping points. They'll become what they call a majority minority. So they are still the largest group but they will be less than 50% of the population. Ryan [jokes] do they have a mandate... no sorry. it seems 67% of Maori voted NZ First? So much for Te Maori Party or Gareth Moragn's pontifications. It seems as though that if a leftish government doesn't hold to your own beliefs, you would prefer a National government. That strikes me as bein rather arrogant. Are you sure your comment relates to this posting and not the one that follows it? As for arrogance: I think that only applies when people voicing their opinion refuse to acknowledge that it's their opinion they're voicing. Confusing one's opinion with incontrovertible fact - that is arrogance. ".........all those who came to these islands – and who come here still in their thousands – to make money." Well that's around 80% of us excluded from your circle of care. All that's left are the Tangata Whenua, non-economic refugees (of whom we have shamefully few) and a few moneyed simple-lifers (or their children) who've wafted in from California or Colorado. Oh, come now, Victor, don't be so willfully obtuse! Yes, we all need money, but most of those who migrated here came for a better, freer, less constricted life in a land without lords and masters. When I talk about those who came here to make money, I'm talking about hose who came here to exploit the land, its resources and all those human-beings with nothing to sell but their skills and their labour. Those are the ones National and its predecessor parties have always served. They are recasting politics as a dispute between the elite and the people, and are rediscovering the forgotten roles of opposition and expression (rather than seeking to govern – in fact, some parties such as Syriza in Greece and the Dutch Party for Freedom have gone to great lengths to avoid going into government). That seems to sum up NZ First. Winny shot up after tackling Devoy. Buoyed by his polling he tried to make the party NZ Everything. The watered down party mopped up only it's core supporters. "most of those who migrated here came for a better, freer, less constricted life in a land without lords and masters"
I think that's a rather rosy view of the main drivers of nineteenth century migration. But your point about who serves who obviously isn't something I'd quarrel with. Ah, lad, you are suddenly for a left coalition. But I can see now your heart is in the right place. The highest polling party is nothing. You're really being bitter now Chris, before the event. Your nasty view of National is quite telling for those who have always believed the main motivator of the left is envy & spite. You give us proof in black and white with this disclosure of how your mind works. Dear Winston, go with Labour, the aarty set up to parasitize the hard worker, the small businesses people and the kind and generous self disciplined citizens who will always help the unfortunate and the needy, even those that make bad choices. Go with the party who live off those who support the whole nation with their work and enterprise. Yes go with Labour the party whose MPs are merely there to take a salary they can never get in the real world and are desperate to protect their own inflated pay packet, because the one thing they get up in the morning to maintain is their wallets, their number one priority. They are almost always landlords because they will not invest in business, the life blood of the country they parasitize. When they talk about 'well paid jobs' being their focus, they mean their own. Give them their Cabinet salaries and you will get the best one you have had ever too. You have that in common with Labour, that's what they mean when they say their policies are more in line with yours. Go Labour Winston! They deserve you. The rest of us don't.